In consideration of provisions of art. 10 para. (6) and of art. 12 para. (11) of Law no. 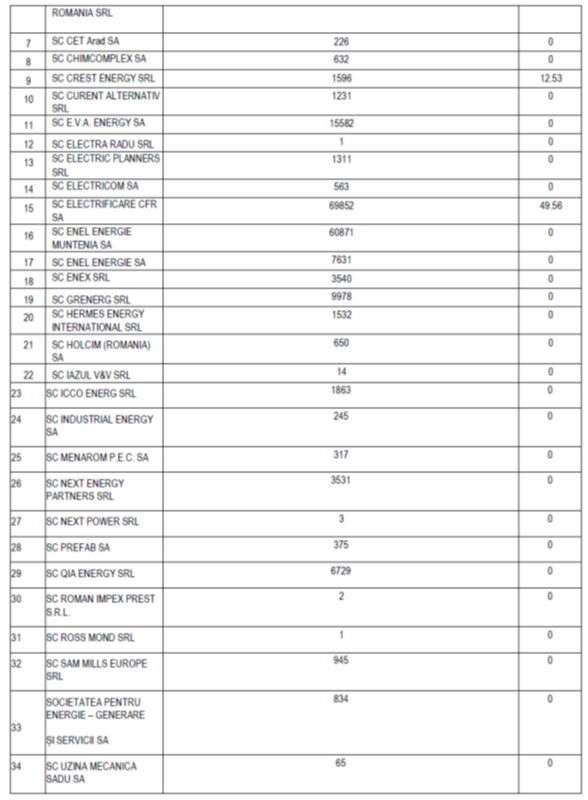 220/2008 on the establishment of the promotion system for energy generation from renewable energy sources, republished, with subsequent amendments and additions, as well as the provisions of art. 11 para. (1) and (2), of art. 16 para. (1) and (2) and of art. 17 para. Pursuant to the provisions of art. 5 para. (1) letter f), of art. 9 para. (1) letter x) of the Government Emergency Ordinance no. Art. 1. 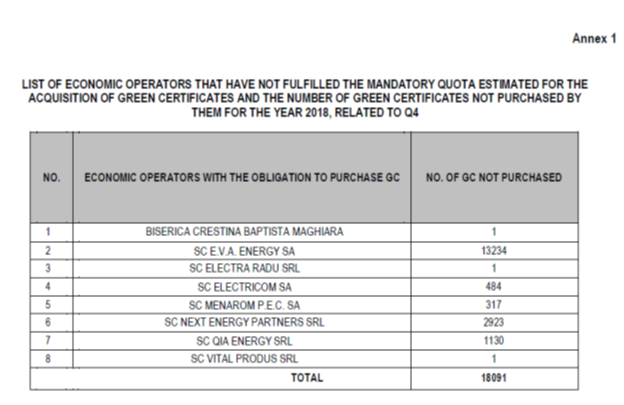 – Approving the list of economic operators that have not fulfilled the mandatory quota estimated for the acquisition of green certificates and the number of green certificates not purchased by them for the year 2018, related to Q4, set out in Annex 1, which is an integral part of this decision. Art.2. – Approving the list of economic operators that have not fulfilled the obligation set out in art. 10 para. (6) of Law no. 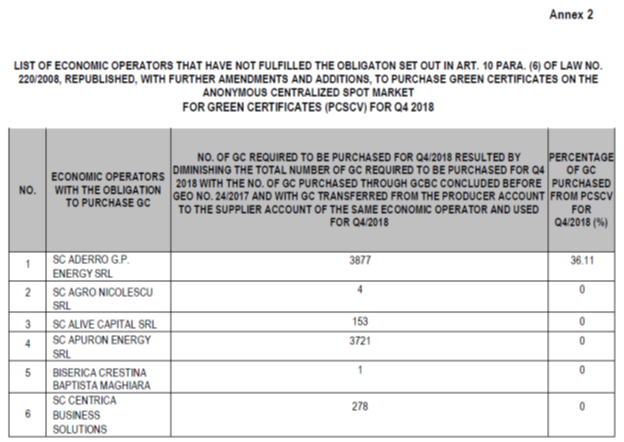 220/2008 for the establishment of the promotion system for energy generation from renewable energy sources, republished, with further amendments and additions, for the acquisition of green certificates on the anonymous centralized spot market for green certificates for Q4/2018, set out in Annex 2, which is an integral part of this decision. Art.3. – The economic operators referred to in Annexes 1 and 2 to this Decision shall fulfill the provisions of this decision, and the organizational entities within the National Regulatory Authority for Energy shall monitor their compliance. Art.4. – This decision shall be communicated to the economic operators referred to in Annexes 1 and 2 to this decision and to the Electricity and Natural Gas Market Operator “OPCOM” S.A.